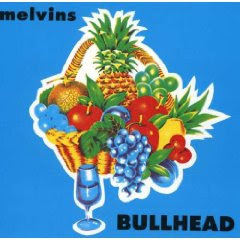 The Melvins' "Bullhead"(1991). A pure, molten, blistering slab of stoner metal from start to finish. Sludgy passages oozing with psychedelia mixed with dizzying stop and start rythyms that explode into full throttle scorching head banging monster riffs. Buzzo's vocals are filled with intensity and fit perfectly with the music, and there is so much energy in The Melvins' playing that even the slow sections never seem lethargic. From the agonizing 10 minute opening track "Boris" through the ending track "Cow", this album never disappoints, and you never know what is coming next. "Bullhead" is my favorite Melvins' album, and has been a huge influence on the world of stoner metal, especially with bands such as Kyuss and Fu Manchu. and here's a live performance of "Boris". Yeah, they are great, and they are still going strong, putting out great new material on Mike Patton's Ipecac label.